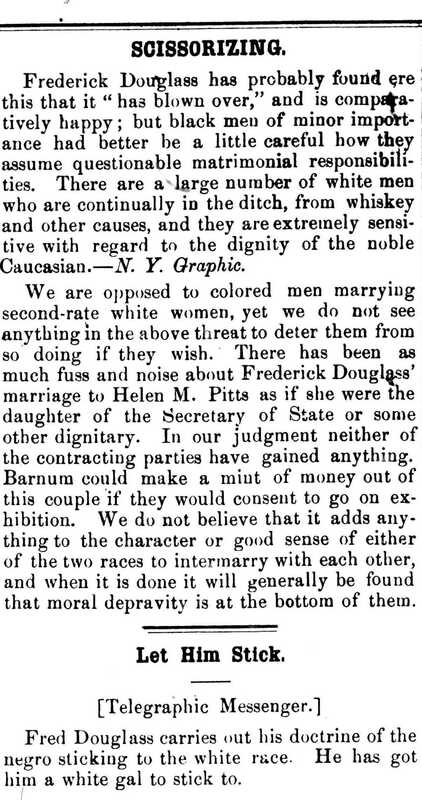 In nearly all I have read on Frederick Douglass and his second marriage, biographers use the same repeated source — The Pittsburgh Weekly News and a paper from Franklin County, Virginia — as a near monolith to represent the public and the press’ reaction. I find this lazy, amateurish, and unfitting of true scholarship. There are only a handful of true biographies (for adult readers) on Douglass, and yet, even with he best of these works, these two sources are repeated and regurgitated. Why not look at newspapers in Washington, DC? In 1884 there were a couple of papers in the city…including The Washington Grit edited by black nationalist John Edward Bruce, who had contributed to The New National Era. Bruce, a fascinating figure recently given some long overdue scholarly attention, later reconciled with Douglass.